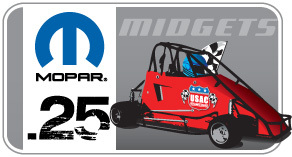 Round two of the 2k11 USAC Mopar .25 Midget “Generation Next” Tour unfolds this coming weekend (March 25-27) at the home of the MCQMRA Quarter Midget Club in Nashville, Tenn. Class champions will receive distinctive commemorative guitars and USAC Medallions as part of the prize packages. “Music City Mayhem” will showcase drivers from numerous states, including some who already have posted 2011 victories at the MCQMRA track located on Central Pike, north of Interstate 40, east of Nashville. Class winners at MCQMRA already this year have included Jackson Boone (Senior Honda and Light 160), Dylan Fetcho (Senior Animal and Heavy 160), Garrett Jones (Senior Animal and Light World Formula), Annabelle Driskill and Garrett Davis (Rookie), Grayson Pate and Thomas Hickman (Junior Honda), Christian Pitman (Senior Honda), Christopher Tullis (Light 160), Aryton Olsen and Caleb McGillivray (Heavy World Formula), Jayme Dickerson (Heavy Honda) and Isaak Solochek (Junior Animal). Signs-ins and heat race pill draws are scheduled on Friday, along with safety checks. Practice, heat races and lower mains are on tap for the competing classes on Saturday, with A Mains set for Sunday, beginning at 9:30 am. Victory lane ceremonies will follow Sunday’s A Mains, with first, second and third-place awards for competitive classes and participation awards for Rookie classes. Live video streaming of Saturday and Sunday action is scheduled on the internet at www.usacracing.com/usac_live, pending signal strength. The “Generation Next Tour” will continue with events at Salisbury, NC, Albuquerque, NM, San Bernardino, CA, West Liberty, OH, Hagerstown, MD, Milwaukee, WI, Indianapolis, IN, Lakeville, IN and Kalamazoo, MI.